Home > technicals > Value Stocks Ending 10-Year Drought? Value Stocks Ending 10-Year Drought? For the past decade, value stocks have been trending lower on a relative basis versus growth stocks; that appears to be changing. One way in which investors can segment the equity market is by style, i.e., value vs. growth. Value stocks tend to be those trading at discounted prices relative to earnings while growth stocks are often higher priced and faster growing. Many folks argue that the proximity of the market cycle has much to do with determining which style is en vogue at a given time. Specifically, growth stocks theoretically fare better during bull markets and value provides better protection in bear markets. We have actually found that the favored style has more to do with the behavior of the underlying sectors than it does the overall market cycle. For example, growth stocks typically have a heavy weighting toward technology and discretionary sectors. Because of that, growth stocks led the advance in the late-1990′s and fared worse in the subsequent decline following the bursting of the tech bubble. Meanwhile value has large weightings toward financial and energy stocks. Thus, value led the rally into the 2007 top, then also led the decline into 2009 as those sectors were decimated. Furthermore, value has continued in a clear downtrend vs. growth for the past decade. Looking at the present, one of the under-the-radar winners of the post-election “Trump trade”, thus far, has been the value portion of the stock market. 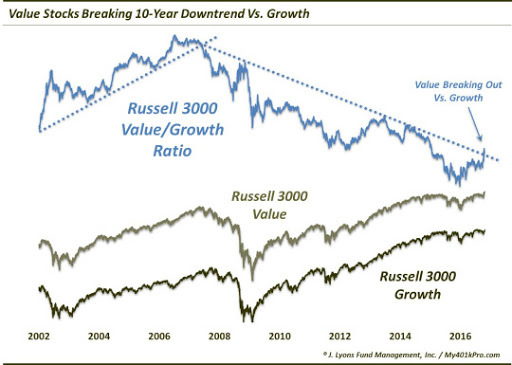 And in fact, thanks in large part to the rally in financial and energy stocks, value looks to be breaking its 10-year downtrend vs. growth, at least when measured by the ratio of the Russell 3000 Value Index to the Russell 3000 Growth Index. Now, even if the trendline break illustrated in the chart is for real and durable, it does not mean that value stocks have to rise and growth stocks fall. The overall market trend will dictate the likely path of both. Indeed, as the chart shows, each index has followed in the same direction for the past 14 years, despite the direction of the Value/Growth ratio. However, a new uptrend in the ratio would favor value stocks relative to growth. If indeed value’s 10-year relative performance drought vs. growth is ending, investing in value stocks would appear to provide for a greater margin of error at this time. And thus, it would suggest that, in general, one now favor value stocks over growth. Courtesy of Dana Lyons, founder of JLFMI and My401kPro (More from Dana Lyons Here).